Jeph was so kind to let me borrow Pintsize again. Then I betrayed his trust by giving the little guy terrifying appendages. Sorry, Jeph! Just a reminder, friends... 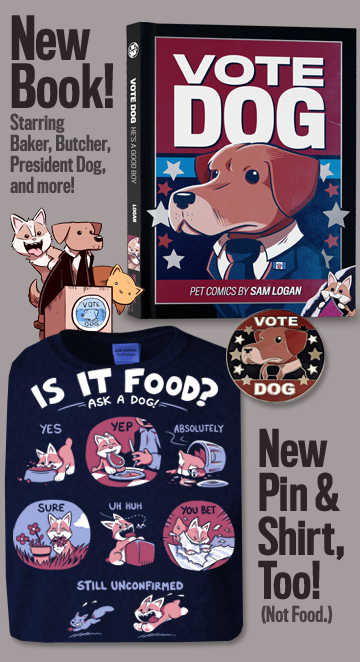 I've got a whole bunch of new swag on sale now, including new shirts, posters, and bumperstickers. We're also doing a CRAZY sale on the Omnibus I & II set, which is an entire 50% off! That's 1500 pages for the price of 750! 8 lbs of books for the price of 4! Sam AND Fuzzy for the price of just one of them! Seriously, though, I think the key things to remember are that Jess' impressions are pretty much physically flawless (incorrect arm placement aside), and that most people in the S&F universe don't even know that shapeshifters exist. So even if Y noticed something off about X, "replaced by an identical doppelganger" is probably not the theory that would cross his mind. He'd be more likely to assume that X was just up to someting, or hiding something from him, or playing some sort of crazy mind game in an attempt to one-up him as a ninja. Jess had already been working at the older, grungier version of the Saucy Hippo for a long time when Gert first arrived... at least ten years, since we saw her in one of Fuzzy's flashbacks! So she and Gert were coworkers at first, until Gert bought the place out, classed it up, and became her boss. Some of the pin-up stuff I've been doing for Patreon -- like this one -- are basically single-panel comics about when they worked together. I think they have a fun dynamic with one another, and the Hippo is a great setting for pin-up stuff, so it's probably something I'll keep exploring that way. Pretty much every character who has ever appeared in Sam and Fuzzy -- at least after the really early gag-based stuff -- was created to fill some sort of specific, direct narrative need. I don't think I've ever come up with a character completely independently and just squeezed them into the comic after the fact. Except maybe for Skull Panda! The interesting thing, though, is which characters wind up sticking around. Jess Star is a great example: she originally was only intended to make one brief appearance. But she wound up returning years later, when I needed a character for a different narrative purpose. I had originally been developing a brand new "master of disguise" character to serve that role, but realized Jess was a lot more fun and interesting than what I was coming up with. The amount of time I spend on designs is all over the place. Some come together extremely fast, while others -- Mr. Sin is a good example -- took a lot of work to figure out. (You can see a lot of the rejected Sin designs in Omnibus II.) And sometimes, I'll take an unused design I had worked on previously and use it for a new character if it seems like a good fit. Hazel was like that... although the character was created to fill a role in the story, her design was partly inspired by some other scarved and begoggled sketches I'd drawn in the past. That's a wrap for this week, team. Come back on Monday for our next comic! How do you decide to introduce a new character into Sam and Fuzzy, and do you plan out their look and personality much beforehand? Have you ever had a character in mind that you decided not to use? International Holiday Shipping Deadline today, and new stuff on sale! My fellow non-Americans! Today is the last day INTERNATIONAL customers can order S&F swag using the cheapest ("First Class") shipping option and still get it in time for Christmas. After that, you'll need to use a quicker option! 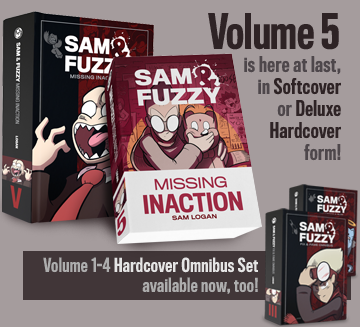 First of all, if you're looking to pick up the first two books in the Sam and Fuzzy saga -- or know someone else who is -- both the softcover and hardcover versions of the Omnibus I & II set are 50% off! It's a screaming deal. I'm literally screaming as I type this. 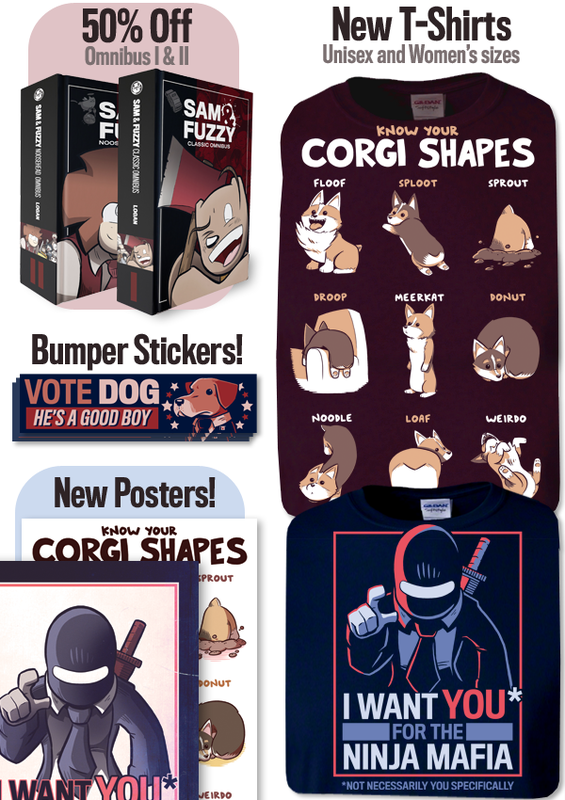 Meanwhile, two new shirts have launched: our all important guide to Corgi Shapes, and a little passive aggressive propaganda from the Ninja Mafia. There are also 11x17 poster print options for each, if you'd rather hang 'em on your wall than on your body. I hope you dig these new goodies. Enjoy! And come back on Friday for our next comic.